Matthew 2:9 says that the star “went before them.” It wasn’t hovering over them, following them, or pushing them on from behind. 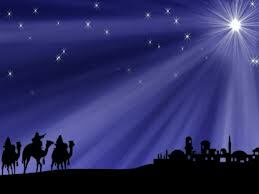 It always stayed where the wise men could see it, directing their next steps forward. I cringe to think what would have happened if the wise men had given up following and tried to route their own way to Jesus. What a tragedy if they had turned back because the trip was taking too long, they couldn’t stand each other’s company anymore, or they were pining for the comforts of home. The Christmas story wouldn’t have been the same. Jesus wouldn’t have received the gifts that God used to provide for His Son’s earthly needs. The wise men wouldn’t have received the reward for their efforts, gained an inspiring story to share with their children, or been included in the manger scene two thousand years later! Like the wise men, God has set a prize in front of us. We won’t see it, however, if we’re getting distracted by our past mistakes, hurts, disappointments, or even our past joys. Jesus is asking us to focus on Him, our Star. Our past may draw us back, but when our eyes are on our star, we’ve got to remember that He is leading ahead, not pushing from behind. He’s in our present and future, not hanging out in our past. He’s trying to take us to an exciting place where He alone can take us. He’s asking us to forget what’s behind and reach forward to where He is. I believe we all want to be “wise men,” mature like Philippians 3:15 says. In God’s eyes, wise and mature people “forget those things which are behind.” They press forward because people who follow their star always get the prize!